Before Ms. LCohen came to Blair, she taught English in Lesotho in southern Africa. 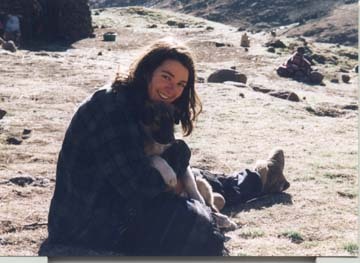 This is a picture of her in Lesotho with her little puppy. Ms. Cohen is a new ESOL teacher in Blair. Her students like her a lot. Daniel is in ESOL level 4. He's a freshmen student from Mexico and he is in Ms. Cohen's class. Daniel said, "Ms. Cohen is nice to her students. Sometimes she shares things with her students and talks about what her life is like." Ms. Cohen was born in Binghamton, New York. When she grew up, she went to college at the University of Wisconsin in Madison, Wisconsin. After college she joined the Peace Corps. The Peace Corps is a big group of Americans who volunteer in other countries. She went to Lesotho in southern Africa. She taught English there for two and half years from 1995-1998. She thought Africa was beautiful. "It was very colorful, and the people were friendly," she said. "I liked Africa very much." She went to many different places in Africa. She came back to the United States and went back to school. She got a scholarship to study education to become a teacher in the United States. She went to George Washington University. For her first teaching job she taught ESOL in Bladensburg High School in Prince George County. She was there for two years, and then she came to Blair. She teaches ESOL levels 1, 2 and 4 in Blair. Ms. Cohen is happy at Blair. She said, "Blair is the best because I like the students who are from many countries."